This is one of the moments I've been building toward, one of the ones I've been eagerly anticipating writing. President Reilly, a.k.a. Firehawk, finally gets to command the spotlight, in the most dramatic fashion possible. In a way, it's a reprise of her earlier battle against a legion of Man-Bats, but it's also the State of the Union address! And it's her confronting, head-on, the challenges of the public's negative perception of superheroes, allowing herself to be viewed as the first time, as president, as a superhero. 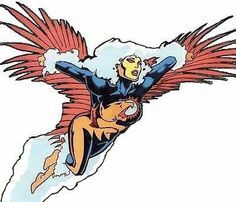 I didn't invent the concept of Firehawk as a politician. I first came across her in that regard in the pages of Firestorm. Her secret origin is actually horrifying. The daughter of a US senator, Lorraine is kidnapped as forcibly experimented on, in the hopes of duplicating Firestorm's powers. The results aren't quite as intended, but she does in fact gain superpowers, and eventually a reputation as a bona fide superhero, who eventually for a time joins the odd "Firestorm matrix," in effect finally becoming Firestorm. But not before becoming herself a US senator. She doesn't even rate her own Wikipedia page, however. She's lumped in for one of those group pages of miscellaneous characters, with a fairly brief entry even at that. Yet Firehawk has fascinated me since, as I've previously mentioned, I first learned about her on the back of a trading card, and then her later appearances in Firestorm, as a senator, as part of the Firestorm matrix (there's usually two individuals who comprise Firestorm: the one who represents the body and the one who in effect represents the mind, the role Firehawk assumed). Her major role in Crisis Weekly is a small indication of what I consider to be her vast potential. It's good when you can expand or reinvent mostly forgotten characters. It was one of the things I liked about the Transformers Lost Light series in that it did a lot with characters mostly forgotten. That's the beauty of doing something like this. Marvel has produced its fair share of superheros over the years. Earths mightiest heroes are the Avengers and ok so we know about the popular ones like Thor but what about Thor Girl? Ms Marvel melded with Captain Marvel's dna during an explosion becoming one of the Avengers. My next project here will be with Marvel characters. Thats a big project Tony. Marvel has lots of popular interesting characters like the invisible woman whos real name is Sue Storm Richards. Surprisingly there are ones which Marvel wants us to forget like the Friend who has a supporting buddy called "son of God" That idea is so never ever getting into a movie! It'll probably be a shorter story than Crisis Weekly.